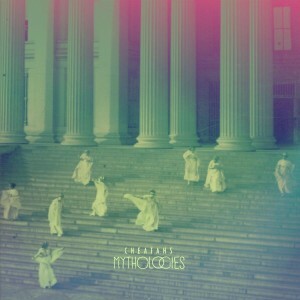 London’s Cheatahs clearly do not sit upon their critically acclaimed laurels, content in the moment. The foursome of Nathan Hewitt, James Wingall, Dean Reid, and Marc Raue hustled out 2 EPs between their self titled debut in 2014 and their 2015 sophomore album: Sunne and Murasaki. Yes indeed, Japanese writing fan, it was inspired by the author Murasaki Shikibu. Now they burst forth with Mythologies, the second full length (seriously – at 13 tracks thanks to some EP love added in) to be released from Wichita Recordings. Pedals, haze, and distortion scream “shoegaze” as a genre label, but what is interesting about Cheatahs is they clearly do not wish to be confined to one stingy label. First single “Seven Sisters” has the guitars and drums for rock ‘n roll, baby! Plus vocals from Liv Willars and Heather Perkins complete the atmosphere of technicolor melodies woven through the beats and haze like spider webs. Throughout the 13 tracks we see that Cheatahs are striving to experiment with their sound, their voice, and what they want to try next. If recent habits are any indication, we won’t have a long wait to find out.